CKRA-FM returned from its all-Christmas-music format on Dec. 26 with a new name: 96.3 The Breeze. 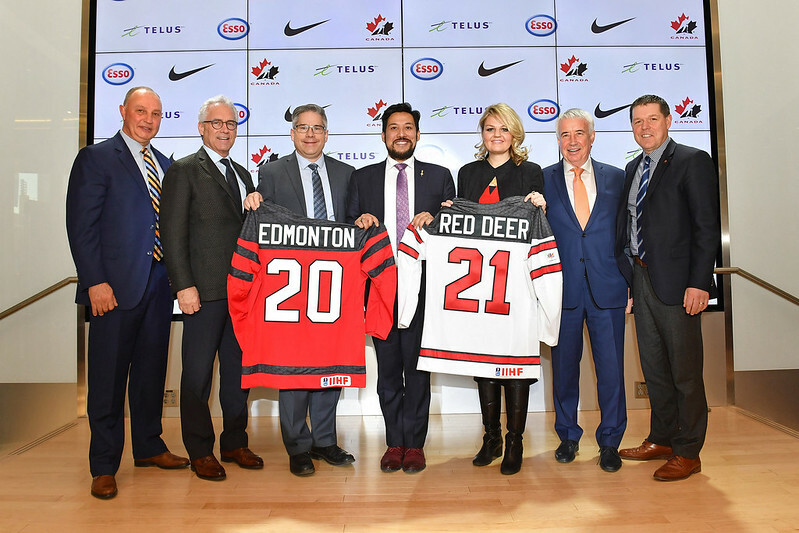 The format is not unique to Edmonton, with Vancouver’s CHLG-FM making the switch to The Breeze last month. Larry Donohue retired as CFCW’s Music Director on Dec. 21 after 50 years in radio, 35 of them with CFCW. “On Larry’s last day country’s shining star Brett Kissel came into the station and serenaded Larry with the song “The Cowboy Rides Away” and then shared with the staff how much Larry’s support propelled his career by playing his music on CFCW,” reports Marty Forbes. CFCW drive host AJ Keller has taken over the Music Director responsibilities. A trailer has been released for Boyle McCauley News: 40 Years – The Little Community Newspaper That Could. The film will be released in March. News from the Alberta Podcast Network: The Read-Along and OtherWise are the newest members and six member podcasts have been nominated for Canadian Podcast Awards. Here is the latest APN roundup. From Wired: The ‘Future Book’ Is Here, but It’s Not What We Expected. It’s super long, but I found some great media nuggets in this transcript of Ezra Klein and Kara Swisher talking about the future of journalism. NBC, ABC, CBS, PBS and Fox will all “provide wall-to-wall coverage of President Donald Trump’s prime time address on border security on Tuesday,” according to CNN. CNN, Fox News and MSNBC will all carry the address live, as well. Happy New Year! It was nice to have a break, but now I’m ready to get back down to business. Former Edmonton-Mill Creek MLA and Speaker of the Legislative Assembly Gene Zwozdesky has died of cancer at the age of 70. The City has mailed 2019 property assessment notices. “Overall, the residential market experienced a 1.7 per cent decrease in assessed value.” Call 311 if you have any concerns with your assessment. March 11 is the deadline to file formal complaints with the Assessment Review Board. Property tax bills will be delivered in May. A report issued by the Civic Service Union 52 before Christmas says the City could cut management positions to save $100 million over a four-year budget cycle. “Micro-management in an organization this complex can cause gridlock,” wrote Elise Stolte. China stopped accepting 24 kinds of waste at the beginning of 2018, including paper and plastics. Now Edmonton-area municipalities are struggling to manage the increased recycling costs. 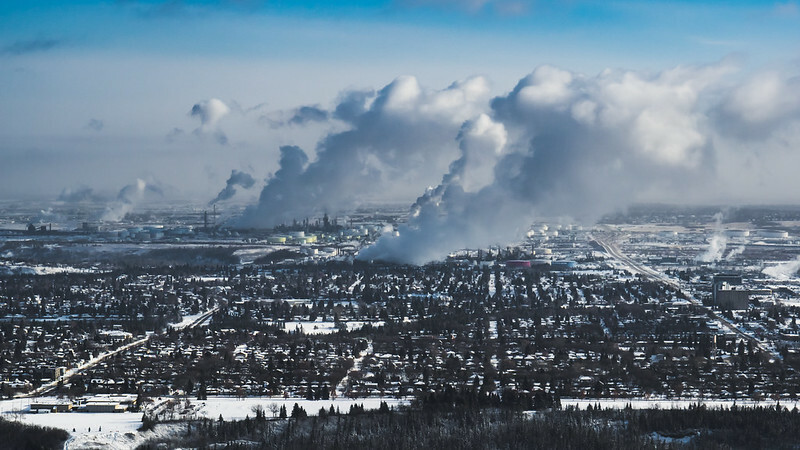 “It has increased the competition across the board,” said Mike Robertson, contract manager for Edmonton’s Materials Recovery Facility. According to Statistics Canada, Alberta lost nearly 17,000 jobs last month. The unemployment rate in Edmonton was 6.3%. The City of Edmonton’s urban hen program is capped at 50 sites and there are currently 12 applicants on the waiting list. Edmonton’s first baby of 2019 arrived 21 days ahead of schedule, weighing in at five pounds, seven ounces. She was born just eight minutes into the new year. Put your Christmas tree out next to your garbage bags by 7am on Wednesday and the City will collect it for recycling. “For Christmas trees to be acceptable for composting, all ornaments, tinsel, garlands, nails, screws and tree stands must be removed.” You can also take natural Christmas trees to an Eco Station for free until January 31. Get the latest on Media, Tech, Health Innovation, Music, and Council with Taproot Edmonton’s latest roundups. We’re back at it this week! Ice Castles Edmonton opened up in Hawrelak Park for the new year! It runs until March, weather permitting. The Indigenous Health Initiatives Program in the Faculty of Medicine & Dentistry is hosting the Indigenous Health Lunch & Learn Series on Wednesday at the University of Alberta. EEDC’s 2019 Impact Luncheon takes place on Tuesday at the Edmonton Convention Centre. Tony Robbins is speaking at the Edmonton Convention Centre all day Thursday. IDEA is hosting its 2019 Winter Bash on Thursday at The Pint downtown. The Oilers host the Panthers on Thursday and the Coyotes on Saturday. The Edmonton Motorcycle Show runs Friday to Sunday at the Edmonton EXPO Centre. SYC Brewing is holding its grand opening on Saturday in the west end. Deep Freeze: Byzantine Winter Festival takes place on Saturday and Sunday along Alberta Avenue. West Edmonton Mall’s Lunar New Year Extravaganza takes place on Saturday and Sunday at the Ice Palace. The Oilers Skills Competition takes place on Sunday afternoon at Rogers Place. 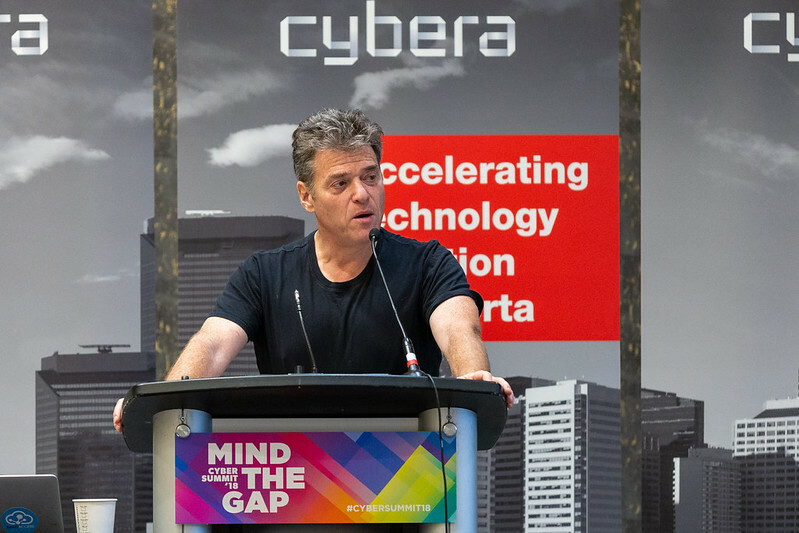 Andrew Keen was the keynote speaker on the first day of the Cyber Summit last month, an annual technology conference organized by Cybera. They were gracious enough to host me this year as a guest. The theme for 2018’s event was “Mind the Gap: Surviving (and Thriving) in the Age of Disruption”. That’s exactly where Keen began. “We are living through the age of disruption,” he said. Keen is an entrepreneur who founded Audiocafe.com back in 1995, but he’s best known as an author and critic of Internet culture. I remember reading his first book, The Cult of the Amateur, shortly after it was published in 2007. As an entrepreneur myself (in podcasting) not to mention an early and enthusiastic adopter of Twitter, I remember strongly disagreeing with his critique of Web 2.0 and user generated content. It made me angry. I had read James Surowiecki’s The Wisdom of Crowds around the same time and I couldn’t believe how different Keen’s perspective was. Why couldn’t he see?! So, it’s no surprise that I started reading Keen’s latest book, How to Fix the Future, with some hesitation. Would it rankle me as well? I hadn’t finished it by the time the keynote rolled around, but I had read enough to have an idea of what to expect. And I was looking forward to it. “I’m not a Luddite,” Keen protested. “I’m not suggesting there aren’t benefits of technology, that’s self-evident.” He also knows that there’s no going back. “Digital is the reality, for better or worse, and we need to make it work,” he said. In his keynote as in his book, Keen spoke about Utopia, written by Thomas More in 1516. It was “a call to arms, to make the world a better place,” he told us. It’s a useful way to frame his argument that each of us has a responsibility to be a part of the solution. “We have to be careful not to fall into the utopian discourse of the first generation of web tech,” he warned. Keen suggests we have five tools with which to fix the future: regulation, competitive innovation, worker and consumer choice, social responsibility, and education. He only spent a few minutes on these in his keynote, but elaborates on each in the book. The section on regulation stood out for me. He compares the current state of technology to that of the automobile in the 1960s when the lack of safety regulations resulted in high numbers of auto-related deaths and injuries. He shared the story of how Ralph Nader’s bestselling book Unsafe at Any Speed brought the issue of traffic safety into the national discourse and led to the passage of seat-belt laws and other traffic safety measures. Could something similar happen in tech today? I don’t know what the digital equivalent of the seat-belt might be, but I do know that not a day has gone by since I read the book that some sort of big tech-related problem hasn’t been in the news. New privacy breaches, new abuses of power, and new unintended consequences seem to dominate Techmeme these days, usually in reference to Facebook and Google. I have since finished reading How to Fix the Future and would recommend it. I think Keen raises some important issues and does indeed provide some thoughtful commentary on potential solutions. Many in the audience found Keen’s keynote to be a downer, and there were plenty of comments about it being a pessimistic start to the conference. He certainly prompted a lot of discussion among attendees, which is all you can really ask for from a keynote. But I found myself on common ground. Maybe in the decade since I read his first book I’d become more critical of technology, or at least more aware of the possible negative consequences. Maybe Keen had mellowed somewhat, adopting a more pragmatic approach in the hopes of effecting change. Or maybe, it was a bit of both! 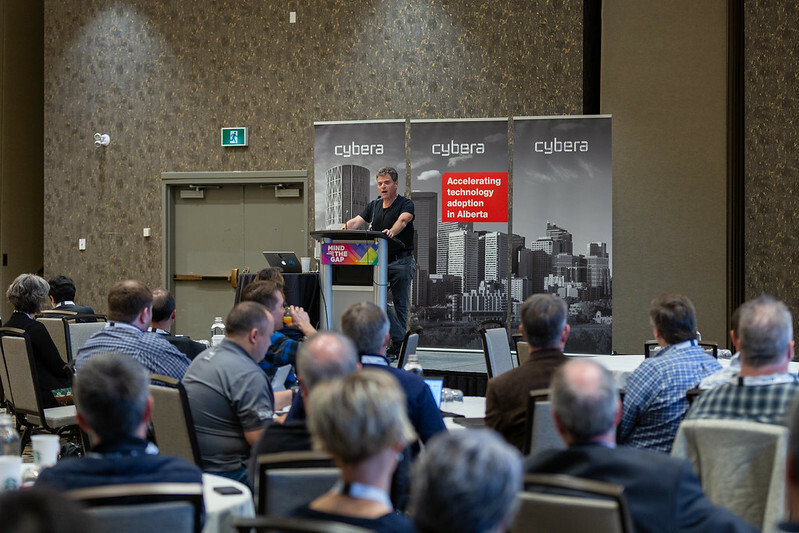 Thank you to Cybera for hosting me at Cyber Summit 2018! 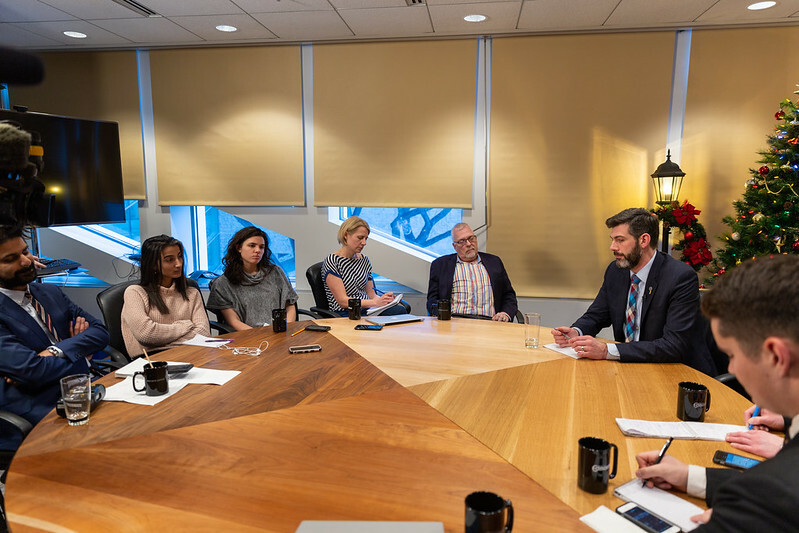 “I believe this was the year we made a shift to building Edmonton for the next generation,” said Mayor Don Iveson last week as he hosted the media at City Hall for a briefing and roundtable discussion on 2018. Given the budget hadn’t yet passed when the roundtable took place, there were some questions related to cost savings. 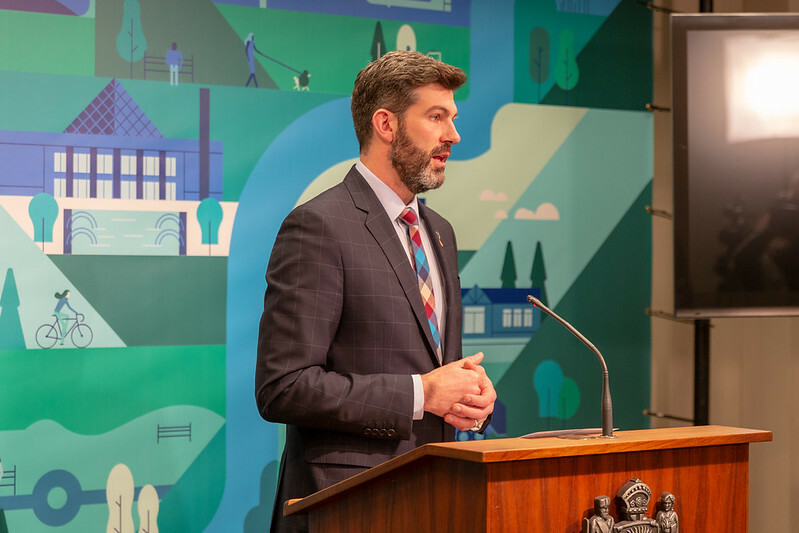 Acknowledging there were valid questions about the size of the City organization and in particular the size of management, Mayor Iveson said “it will be a continuing conversation for us.” He noted there are pros and cons to reducing the size of management that need further discussion. Asked about his frustration this summer over the way Administration handled things like the bench plaques program, the mayor said “mistakes are going to happen given the complexity of what we do.” He acknowledged that Council had given Administration competing direction to both save money and to be as helpful as possible. “Both are values this organization has and they conflicted with one another,” he said. The mayor made it clear he doesn’t want to micromanage things. “I don’t think every complex decision needs to come from Council,” he said. “It’s not an effective use of the thirteen members of Council.” Instead what he’d like to see is a “culture of confidence”. “My expectation is that anyone working at the City with an idea that could lead to savings has the opportunity to bring that forward as opposed to being afraid to suggest it due to risk management,” he explained. That requires “a tolerance for failure and innovation” that won’t come easily. “We have to give some permission for it to not work out,” he said. Mayor Iveson did say that he thought the “long-term culture change is moving in a good direction” at the City of Edmonton. Unsurprisingly, some of the journalists in the room were curious about the mayor’s thoughts on the media. He has made suggestions throughout the year that the City needs to do more of its own storytelling, and of course he continues to be active on Twitter and his own website. “I think people expect a certain amount of direct content from their city,” the mayor said. “I think for most people the City of Edmonton is a credible source.” He doesn’t see direct communication from the City being the only channel, however. He talked about the importance of transparency and opening up multiple channels to the public. “Earned media is always going to be part of our day-to-day connecting with people,” he assured everyone. We didn’t have as much time to discuss the region as I’d have liked, but Mayor Iveson did touch on the subject. “If the region can speak coherently to the provincial and federal governments we can have much greater impact than historically we’ve had,” he said. The mayor cited work on transit, the regional growth plan, and economic development as recent successes in the region. “I really like being Mayor of Edmonton and I have no plans to enter federal politics, other than to stay on as chair of the Big City Mayor’s caucus,” he said in response to a question about running for another office. 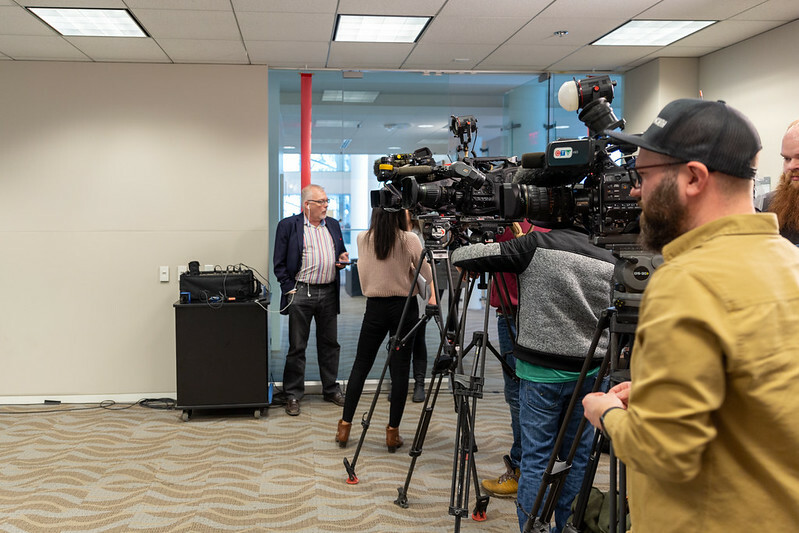 “I’ve got more work to do here.” Mayor Iveson told us “the City Plan is going to be a lot of fun” and that representing Edmonton through the upcoming provincial and federal elections would be “a great challenge”. I spoke with Marvin Polis about the state of digital journalism for the newest episode of the IABC Edmonton podcast. Tracy Hyatt is the new Marketing & Communications Manager at the Downtown Business Association. Episode 21 of Don’t Call Me A Guru features Alex Hryciw, Communications Advisor for the Office of the Mayor & Mayor Don Iveson. As a big fan of The Wirecutter, I enjoyed this Vox look at the rise of the recommendation site. Twitter co-founder Evan Williams has apparently expressed interest in buying New York Magazine. “We are going to significantly increase our investment in original editorial in the next year,” Williams, 46, said in a statement. Netflix is getting serious about original movies. The company is aiming to make 55 original films a year, including some with budgets as high as $200 million. It’s that time of year again! Here is NiemanLab’s Predictions for Journalism 2019. So much to digest. City Council finalized the 2019-2022 Capital, Operating, and Utilities budgets on Friday. The expected property tax increase is 2.6% per year (or about $65 for the average household). The latest Council Roundup has all the details and remarks from Councillors. Edmonton Transit is adjusting bus schedules over the holiday period. Regular service will resume on Saturday, January 5. The shortlist for the 2018 Edmonton Music Prize has been announced. The winner of the $10,000 award will be announced on February 5. Edmonton’s Alphonso Davies has become the youngest winner of the Canadian Men’s Soccer Player of the Year Award. “He has been a standout performer for club and country and that is just a consistent reality now for Alphonso Davies,” Canada coach John Herdman said in a statement. The minimum separation distance for liquor stores was officially dropped for Ice District this week. “I’m not saying they should get away with anything, or we should throw our hand up and say yes to anything, but I don’t see how this is a wild ask for them to have a liquor store for their residents and for the people who stay in the hotel,” said Councillor Scott McKeen. According to a new report by Altus Group, “large-scale transaction in Edmonton’s office market bolstered year-to-date investment sales 38 per cent over the first three quarters of 2017.” Office sales accounted for 40% of all investment activity in the city, led by the $400 million sale of Edmonton Tower to AIMCo. A proposed land swap involving park space in Oliver is being met with resistance in the community. Abbey Lane Homes wants to put a 24-storey residential high-rise at the corner of 104 Avenue and 118 Street in Oliver Park. Edmonton’s NextGen is accepting speaker proposals for the next Pecha Kucha Night taking place on February 8 at the Royal Alberta Museum. 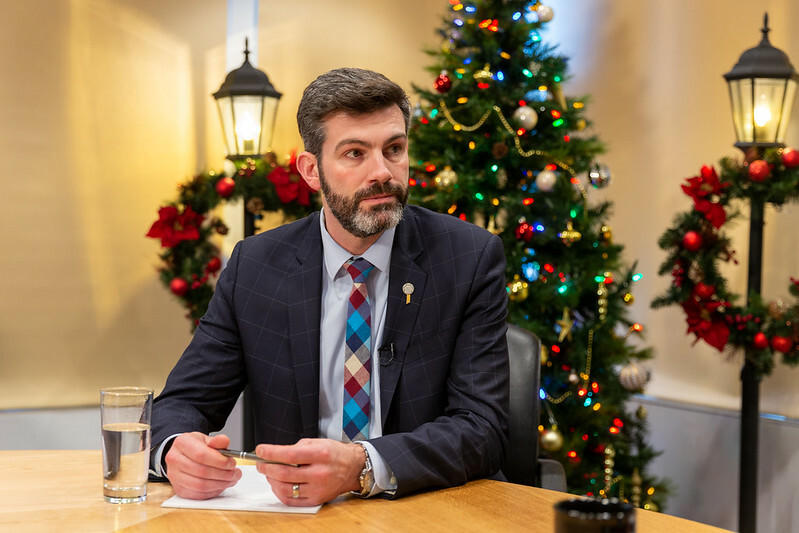 In the latest episode of Speaking Municipally, Troy and I wrap-up the budget discussions and talk about Mayor Iveson’s end-of-2018 media availability. Candy Cane Lane is celebrating its 50th anniversary this year! The lights are on and sleigh rides are available until December 23. The lights are now on at the Alberta Legislature grounds! Until December 23 you can enjoy musical performances in addition to the lights. 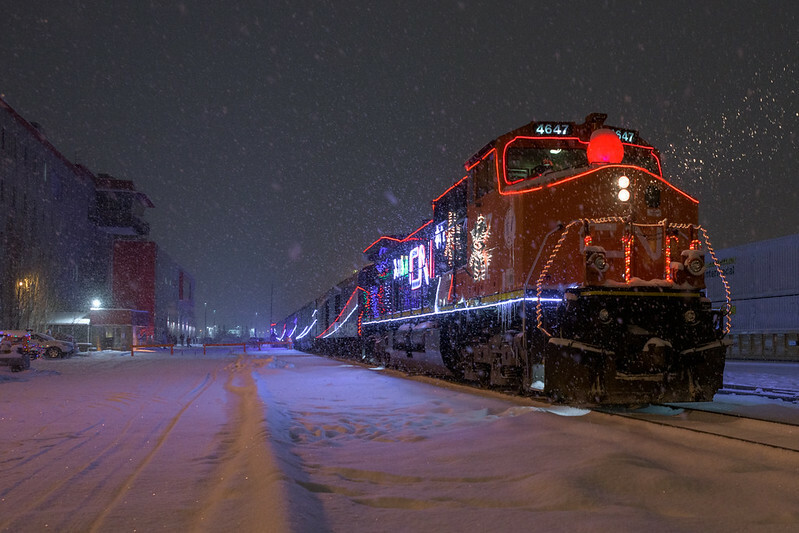 Christmas Glow Edmonton is on at The Enjoy Centre in St. Albert every day until mid-January. Learn about machine learning at Amii’s Machine Learning 101 on Monday at lunch at Startup Edmonton. The 37th annual Christmas Bureau Breakfast takes place on Tuesday morning at The Westin Edmonton. The Oilers host the Blues on Tuesday and the Lightning on Saturday at Rogers Place. Jason Lee Norman is speaking about his 40 Below anthologies at the McLuhan House Book Club on Thursday evening. Paths for People and Coffee Outside are hosting an outdoor coffee meetup at Constable Ezio Faraone Park pn Friday morning. Shumka’s Nutcracker takes place at the Northern Alberta Jubilee Auditorium on Saturday and Sunday. Heads up: EEDC’s 2019 Impact Luncheon will take place on January 8. The latest radio ratings are out, and once again 102.3 NOW! Radio (CKNO) is on top. Numeris reports a 10% share for the radio station in the period August 27 – November 25 period. CBC Edmonton’s Garrette McGowan is not returning to Edmonton AM. “I’ll just say that it was never a job to me,” he tweeted in response to the outpouring of support he received on social media. “He’ll be taking on a new role here at CBC Edmonton that’s connected to our plan to do more reporting in communities across the city,” wrote Mark Connolly on Facebook. No word on a timeline. Anna Junker has announced she is joining Postmedia here in Edmonton as a full-time reporter. She had been working as an intern at the Calgary Herald since May. CTV Edmonton announced that Nahreman Issa will anchor CTV News at Noon. Originals may make up just 8% of the content available on Netflix, but in October it accounted for 37% of all streams in the U.S. According to the City’s chief economist John Rose, Edmonton’s GDP per capita peaked in 2014 and won’t reach similar levels again until the 2030s. “It’s going to be a long hard grind, and for a lot of people it’s going to be a real adjustment to get used to the fact that we’re not going back into another boom,” Rose said, speaking to reporters at the Economic Society of Northern Alberta conference in Edmonton. That aside, Edmonton’s economy won’t be as impacted by cuts to oil production as Calgary’s will. The Edmonton Police Service will get an extra $75 million over four years, which is $12 million less than they asked for. Council also voted to keep the police request for a new helicopter on the table, funded with debt instead of taxes, perhaps. In other budget news, Council voted to take on $112 million in debt to pay for the Terwillegar Drive expressway, approved $16 million for the Coronation Community Recreation Centre, approved $27.5 million for the Stadium LRT Station upgrade and $3 million for design and planning for the 40 Avenue LRT Station using the Alberta Community Transit Fund and debt financing. The Lewis Farms Recreation Centre has received tentative approval but funding won’t be confirmed until next year. 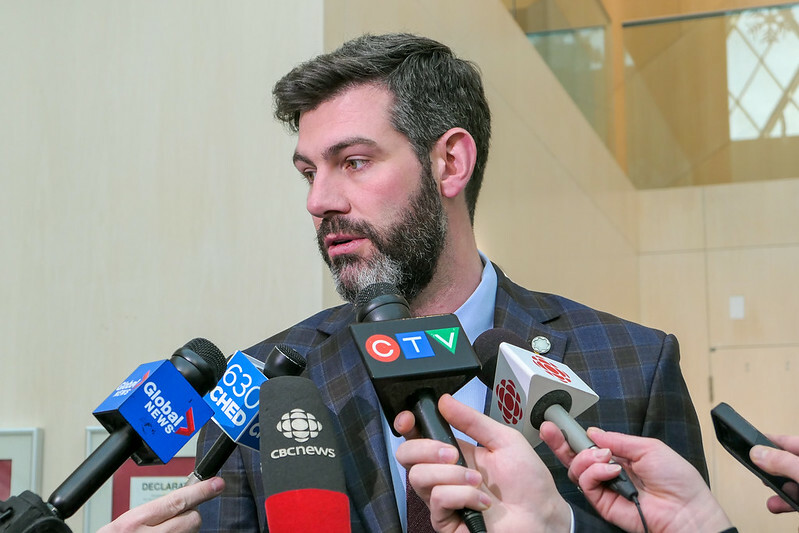 “Taxes should be higher in St. Albert and Strathcona County and Leduc and Beaumont, because the free ride is over,” Mayor Don Iveson said on Friday, referring to the idea that neighbouring municipalities should pitch in to cover attractions within the City of Edmonton. The Province is adding 28 new paramedics and 5 ambulances to Edmonton to help provide faster emergency care. Stantec is looking to light up Ice District with LEDs and digital signs that could display advertising. Four Edmontonians were recognized this weekend at the 12th annual Human Rights Awards, including Greg Lopez, Ahmed Knowmadic, and Mahamad Accord. 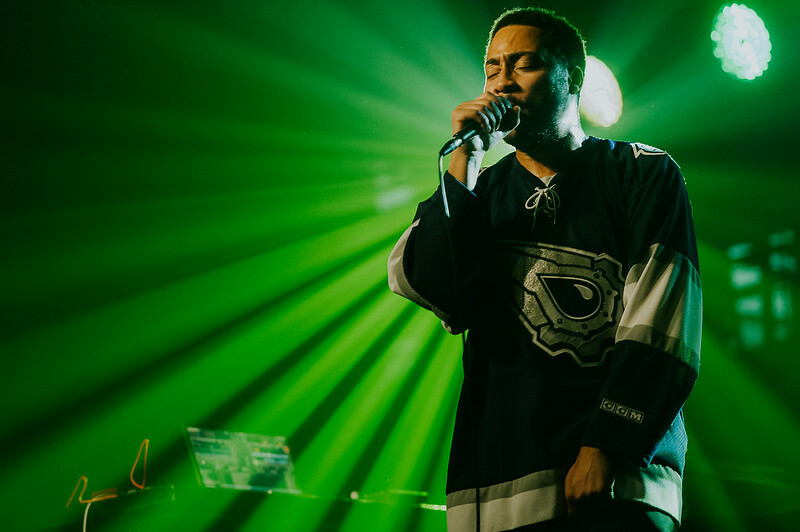 If Edmonton hosted the JUNO Awards in 2022, it could bring in about $3.5 million for the local economy. Our city hosted the awards in 2004. In the latest episode of Speaking Municipally, Troy and I discuss the latest budget news, the Metro Line LRT, and our transit stations. The Stollery Children’s Hospital is hosting the 22nd annual Snowflake Gala at the Shaw Conference Centre on Monday evening. MADE is hosting In Situ: The New RAM Building with Donna Clare on Wednesday evening. The Edmonton Singing Christmas Tree runs Thursday to Sunday at the Northern Alberta Jubilee Auditorium. The Oilers host the Flyers on Friday night at Rogers Place. The 124 Grand Market presents Holiday Bazaar from Friday to Sunday behind MacEwan University. Linda Hoang and Sharon Yeo are hosting an Instagrammable Walls of Downtown Photo Walk on Saturday afternoon from 1-4pm. Meet at Churchill Square! Saturday is your final opportunity to participate in the Gingerbread House Workshop at the City Market inside City Hall. A Very Ritchie Christmas takes place at the Ritchie Community Hall on Saturday evening. Yule Ave: A Merry Christmas takes place on Saturday and Sunday at Alberta Avenue. “Vue going down is not the end of culture in Edmonton, but it sure doesn’t help,” wrote Fish Griwkowsky in the Journal. He joined 630 CHED’s Friday round table with Stephan Boissonneault and Ron Garth from VUE Weekly to discuss the paper’s demise.